Apply extra style to your Applications easily with Sonic Frame ActiveX Control without wasting your valuable time. Arrange and bound the controls by selecting the suitable design and colors. Features Seven Built-in Styles ( WinXP, SuperBlack, PlasticPad, etc.) Unlimited Custom Styles. Alignable, Shadowable Caption Text. Different Styles of Caption Bar. Customizable Border ( Size, Shape, Color, etc.) Gradient Style Background Fill. * Alignable, Shadowable Caption Text. * Different Styles of Caption Bar. * Dragable by clicking on the Frame at Runtime. * Supports All Standard Events. Group controls with XP visual styles and flicker free drawing. Qweas is providing links to Sonic Frame ActiveX Control 2.1.0 as a courtesy, and makes no representations regarding Sonic Frame ActiveX Control or any other applications or any information related thereto. Any questions, complaints or claims regarding this application Sonic Frame ActiveX Control 2.1.0 must be directed to the appropriate software vendor. 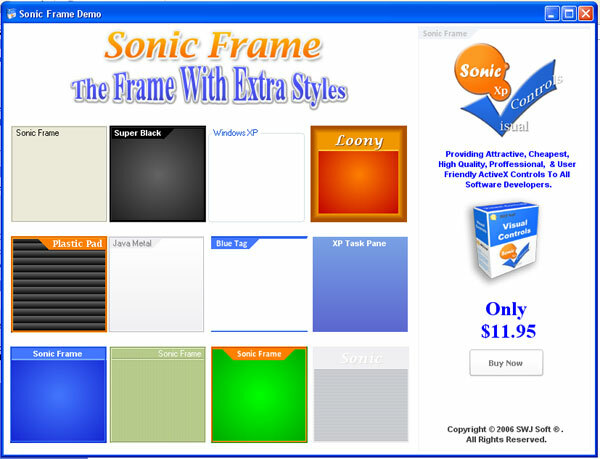 You may click the publisher link of Sonic Frame ActiveX Control on the top of this page to get more details about the vendor.